SHARE YOUR LOVE All Year Long! We you. YOU are an active transportation hero! And YOU are the reason we continue to do the work we do, every single day. The support you show helps improve safety for everyone who walks or bikes throughout the state by choice or necessity. 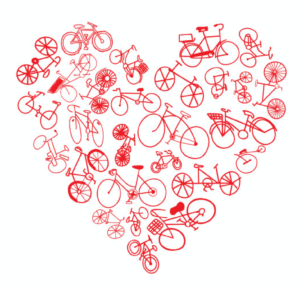 Because you are so dedicated we hope you will Share Your Love for walking and biking all year long by becoming a Monthly StRider Champion, a new monthly giving program of the Idaho Walk Bike Alliance. We hope to have 50 people sign up to be Monthly StRider Champions. Can we count on you? Monthly donations help you by spreading out your giving over the course of a year and adding up to make a big difference! And the stability of year-round funding helps us by allowing us to focus on the day-to-day work that is necessary to ensure Idaho has a balanced transportation system. Our work helps local communities and advocacy organizations get the money, support and technical assistance they need to build and maintain great walking and biking networks. You can set up your monthly gifts with just a few clicks and your online donations are securely processed by technology that protects your financial information. Thank you for SHARING YOUR LOVE for walking and biking. Note: You can become a member or donate as a guest without creating an account. If you already have an account and want to access it to login, or you want to create an account, you will have to scroll up to the top of the page to find the popup login box after you click the ‘Create an Account’ or ‘Login’ links.